OUR FALL 2015 12TH ISSUE “NIGHTMARES AND DREAMSCAPES” IS OUT NOW! This was a very special issue packed full of INCREDIBLE artwork and unfortunately, it will be our last. Thank you all again for your contribution and making this magazine possible! 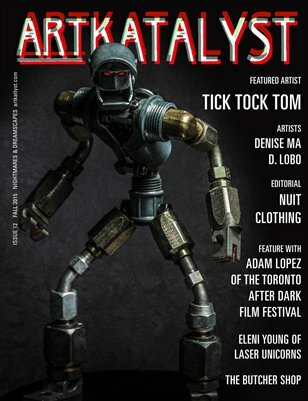 Crow Bird Art, David Davidson, Karen Grosman, Ghost Dive, Hallowette, Laser Unicorns, D. Lobo, Denise Ma, Nuit Clothing, Stephen Schaffer, The Butcher Shop, Tick Tock Tom, Toronto After Dark Film Festival. ← Halloween 2015 issue coming soon!